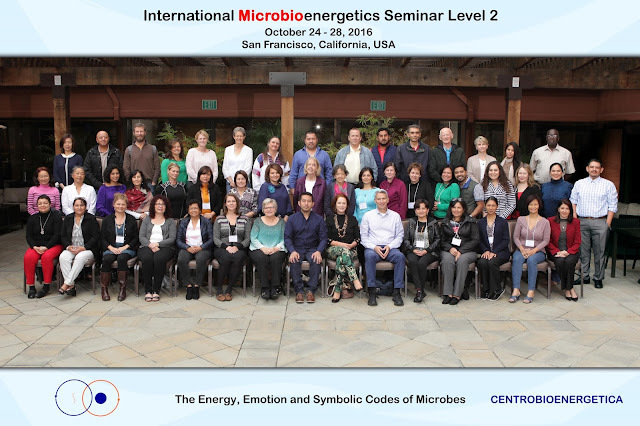 MicrobioEnergetics 2: The Emotion, Energy and Symbolic Code of Microbes! The Certification for becoming a Certified MicrobioEnergetics Therapist consists on completing MicrobioEnergetics 1 & 2. 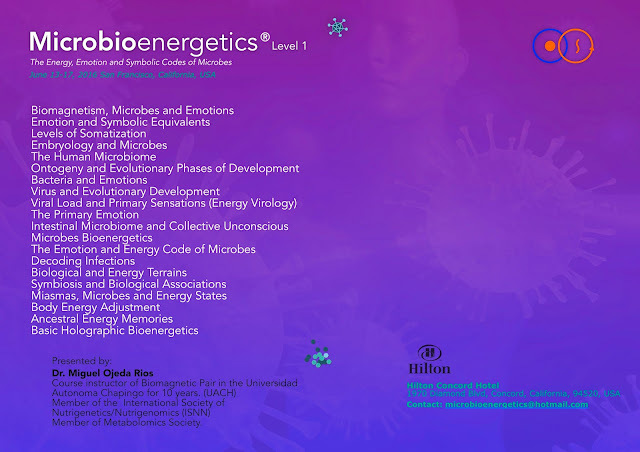 You can take them in any order, if you already have taken MicrobioEnergetics 1, taking MicrobioEnergetics 2 will complete your training. 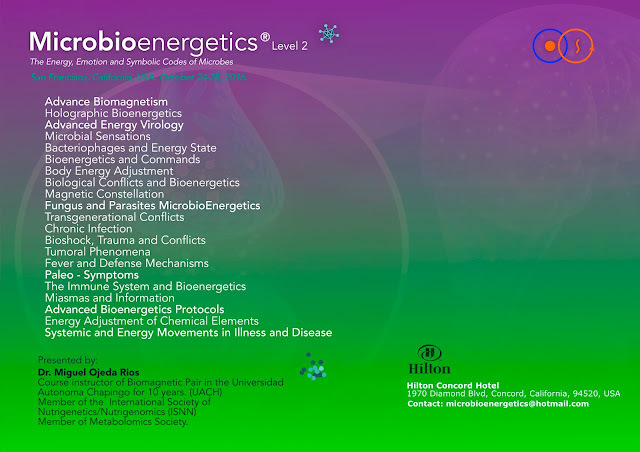 If you take MicrobioEnergetics 2 now you will complete the training when you take MicrobioEnergetics 1 next time it is offered. We believe this training to be a must for all Therapists and Health Practitioners, specially if you are a professional practicing any modality of Energy Medicine, Alternative Medicine, Biomagnetism and/ or Bioenergetics. The information and protocols that Dr. Miguel Ojeda Rios MD, shares with us in class, can be applied in conjunction to other Therapies, including Biomagnetism and everyone can benefit from it, including ourselves and our clients. With MicrobioEnergetics we are able to deactivate the information of specific conflicts and traumas which support Microbes and affecting your DNA and Genes, causing illness and/or boicotting our healing. Dr. Miguel Ojeda Rios MD will share his latest research and experience regarding physical and emotional issues, conflicts, traumas, DNA related issues, Epigenetics and a better understanding of what is the underlying cause of illness, from the moment of conception all the way through gestation, childhood and into adulthood, including transgenerational issues and protocols. 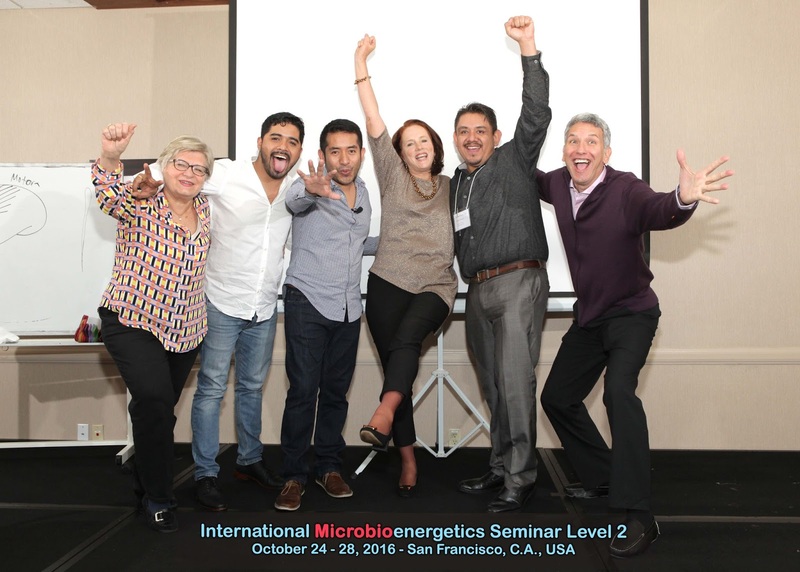 MicrobioEnergetics is revolutionary and extremely advanced healing modality​ created by Dr Miguel Ojeda Rios MD, from his many years of experience treating thousands of patients. It's based on Energy Medicine, DNA information, Epigenetics, Human Genome, Metabolomics, Nutrigenetics & Nutrigenomics, Biological Decoding, Psychosomatic Medicine, Bioenergetics and the Biomagnetic resonance within our bodies also known as Medical Biomagnetism. This healing modality complements any type of Energy Medicine work known today. It is really a fascinating and extraordinary class, and it is considered by many health professionals a cutting edge advanced Biomagnetism and Energy Medicine. 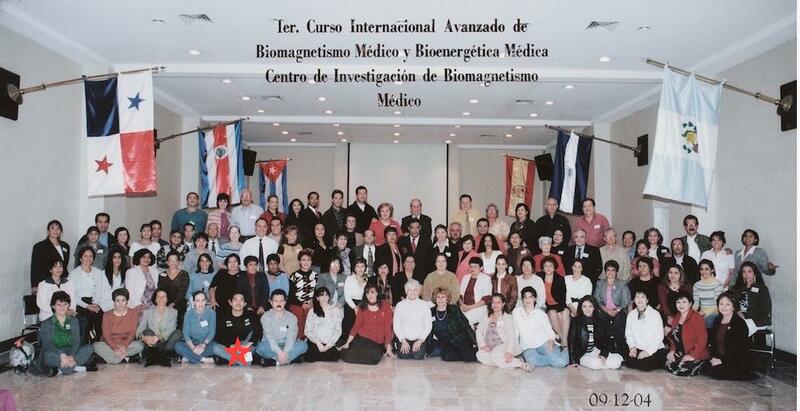 Besides being a brilliant teacher and a Medical Doctor and Surgeon, he was a Biomagnetism and Bioenergetics instructor at the University of Chapingo in Mexico for over 12 years, where he taught a 6 month long Biomagnetism Certification Program. He is also an amazing, compassionate and generous human being with so much knowledge that students who attend his class consider him one of the best teachers they have known. This training will be in Spanish with professional simultaneous translation into English. If interested in attending, please fill out this Application Form, once received, we will send you payment information. Seating is limited to 60 attendees. Please be aware that your space is not reserved till we get a deposit. We recommend to reserve your space ASAP, as our Seminars always sell out. Cancellation requests received by or before May 19, 2019 will incur in a $350 cancellation fee, plus any Paypal or bank fees. There will be no refunds if cancellation request is received on May 20, 2019 or any day after this date. Coffee breaks are daily 11-11:20am and 5-5:20pm. Hotel: The Seminar will be held at the Holiday Inn Miami Beach - Oceanfront Hotel in Florida. We have a limited number of rooms reserved under a group rate of only $139 for single or doubles, $149 for triple and $159 for 4 people - plus taxes a night, which includes Wifi. This rate will be available until reserved room block is full. Fees may go up after. Once you have registered, we will send you the special code and link to reserve your room. Uber has excellent fares from the airport, around $15: www.uber.com. If it's your first time using Uber, please use Promo Code "helenag414ue" for a $10 discount for your first Uber ride!. In the past few years, Dr Miguel Ojeda Rios MD, has being doing an amazing and extensive research on the Emotional, Energy, Genetic and Transgenerational causes of disease and how it relates to Microbes. His research helps us understand why certain people tend to pick up certain pathogens while others who are equally exposed do not get infected. He discovered that Microbes are our allies, they are actually here to teach us and help us overcome fears, traumas and other emotional issues so we can attain a balanced and healthy body, mind and spirit. ​With MicrobioEnergetics we are able to deactivate the information of specific conflicts and traumas which support Microbes, causing illness and/or boicotting our healing. 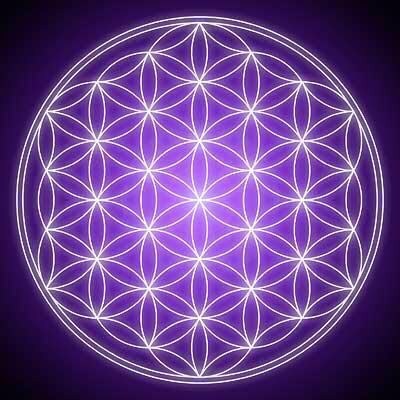 This is a new, revolutionary and extremely advanced healing modality​ created by Dr Miguel Ojeda Rios MD, from his many years of experience treating thousands of patients and based on Energy Medicine, DNA information, Epigenetics, Human Genome, Metabolomics, Nutrigenetics & Nutrigenomics, Biological Decoding, Psichosomatic Medicine, Bioenergetics and the Biomagnetic resonance within our bodies also known as Biomagnetism, that complements any type of Energy Medicine work known today. Giving us an understanding of the Energy, Emotions and Symbolic Codes behind Microbes, who are here to support and help us while resonating with and supporting our own information. It involves the profound understanding of how Microbes are in a relationship with us, affecting us at all levels of our existence and evolution, understanding why we get sick, why each individual attracts certain and specific Microbes, in which exact moment an energy conflict is created leading to a biological conflict that attracts the specific Microbe supporting the information. Dr. Miguel Ojeda Rios MD, also shares a variety of very specific protocols for different conflicts to help us regain and achieve physical and mental health and peace of mind. Microbes help us evolve! As we learn about this subject and we apply and integrate the techniques he has been developing as part of our therapy treatments, patients get better faster and illness tend to not to reoccur. Dr. Miguel Ojeda Rios, MD has been an instructor for The Biomagnetic Pair Certification Program at the University of Chapingo in Mexico UACH, for over 10 years, plus he has a very extensive and busy practice in Mexico City where he has treated thousands of patients successfully. He is also very well known and respected by Biomagnetism, Medical and Alternative Medicine Practitioners in Mexico, Spain and other countries. 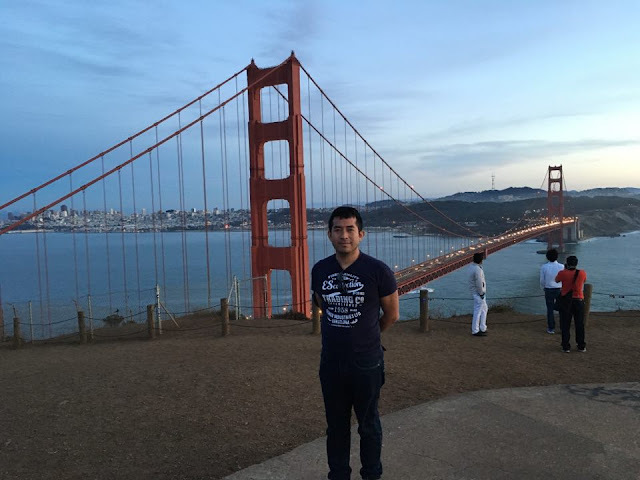 Being also a member of the International Society of Nutrigenetics/Nutrigenomics ISNN, member of the Institute of Noetic Sciences IONS and a member of the Metabolomics Society.